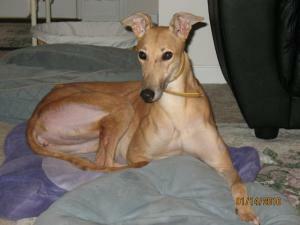 Dusty is a beautiful red female that just arrived from the JCKC Track in Florida. She raced there and at Seabrook. She got up to A level but only raced 37 races. Her sire is the famous Dodgem By Design and her dam is Red Hills Scream. She is a smaller girl racing at 56lbs. She was born on 12/30/06. Dusty passed her cat and small dog tests so should be fine to live in a home with either. Her foster home has decided to keep this pretty girl! Dusty's foster home adopted her and kept her until she passed away in 11/27/17. She will be missed.